Already have a PayPal Prepaid Card account? You can receive special offers and cash back rewards.6 And if you open an optional tiered-rate Savings Account through The Bancorp Bank, Member FDIC, you can earn up to 5.00% Annual Percentage Yield (APY) for balances up to $1,000.7 Plus, with the Refer-A-Friend program,8 for every friend you get to sign up, activate and load $40 on their PayPal Prepaid Card, you’ll both earn $20. There are more than 250 million active PayPal accounts around the globe tapping into a better way to pay. *IMPORTANT INFORMATION FOR OPENING A NEW CARD ACCOUNT: To help the federal government fight the funding of terrorism and money laundering activities, the USA PATRIOT Act requires us to obtain, verify, and record information that identifies each person who opens a PayPal Prepaid Card Account. WHAT THIS MEANS FOR YOU: When you open a PayPal Prepaid Card Account, we will ask for your name, address, date of birth, and your government ID number. We may also ask to see your driver’s license or other identifying information. Card activation and identity verification required before you can use the PayPal Prepaid Card Account. If your identity is partially verified, full use of the PayPal Prepaid Card Account will be restricted, but you may be able to use the Card for in-store purchase transactions. Restrictions include: no ATM withdrawals, international transactions, account-to-account transfers and additional loads. Use of PayPal Prepaid Card Account also subject to fraud prevention restrictions at any time, with or without notice. Residents of Vermont are ineligible to open a Card Account. 1 Other costs, terms, and conditions are associated with the use and reloading of this Card Account see the Cardholder agreement… For a detailed list of fees, see the Card Account fees. 2 Use of this Card requires a PayPal Account. You must have or establish a PayPal Account then link this PayPal PrePaid Card to your PayPal account. 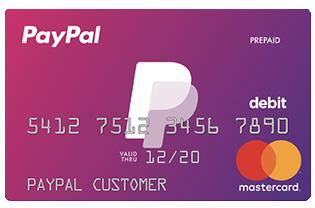 Visit www.paypal.com to get one - or, get one when you activate this PayPal Prepaid Card online. You will not be able to go online to access balance information, your transaction history, PayPal Transfers, the PayPal Prepaid card’s mobile app, and the optional Savings Account unless you link a PayPal Account to this PayPal Prepaid Card. The Bancorp Bank and Mastercard are not affiliated with, and neither endorses nor sponsors the PayPal account to which various funding sources, including a PayPal Prepaid Card, may be linked. 3 Faster access to funds is based on comparison of Netspend’s immediate availability policy versus the typical banking practice of only posting funds after settlement. Direct Deposit and earlier availability of funds are subject to payor’s support of this feature and timing of payor’s funding. Check with your payor to find out when the direct deposit of funds will start. 4 Money transfers may only be made in the name of a valid PayPal Prepaid Mastercard Cardholder and your PayPal Prepaid Card must be activated and linked with your PayPal Account at www.paypal.com. Only one (1) PayPal Prepaid Card may be linked to one (1) PayPal Account. If a member of your household has another PayPal Prepaid Card Account, another PayPal Account in that person’s name is needed to enable money transfer capability. Transfers from the PayPal Account to the PayPal Prepaid Card Account are limited to the amount of funds available in your PayPal Account and may not exceed $300 a day/$2,000 per rolling 30 days. Overdrafts are not available. Money cannot be moved directly from individual funding sources like credit or debit cards, bank accounts, etc., attached to the PayPal balance to the PayPal Prepaid Card Account. Transfers from the PayPal Account to the PayPal Prepaid Card Account cannot be reversed or canceled. The Bancorp Bank and Mastercard are not affiliated with, and neither endorse nor sponsor the PayPal account to which various funding sources, including a PayPal Prepaid Card, may be linked. 6 Cash back rewards is an optional program. You may opt-out at any time by visiting your cash back rewards Summary Page at your Online Account Center. The reward offers we choose and send to you are based on your shopping habits. Netspend will not share any personal information about you with the merchants who sponsor offers. When you activate an offer and make a purchase with the card, the merchant will not know you are a cash back rewards customer, but you will become their customer. For more details about how and when you get rewarded, see the program FAQs, terms and conditions in your Online Account Center. Cash back rewards are credited to your PayPal Prepaid Card Account and are not available in the form of a check or other direct payment method. Program sponsor: Netspend Corporation. The Bancorp Bank is not affiliated in any way with the program and neither endorses nor sponsors it. The interest rates and APYs of each tier may change. The APYs were accurate as of October 18, 2017. These are promotional rates and may change without notice pursuant to applicable law. No minimum balance necessary to open Savings Account or obtain the yield(s). Because Savings Account funds are withdrawn through the Card Account (maximum 6 such transfers per calendar month), Card Account transaction fees could reduce the interest earned on the Savings Account. Card Account and Savings Account funds are FDIC-insured through The Bancorp Bank, Member FDIC upon verification of cardholder’s identity. For purposes of FDIC coverage limit, all funds held on deposit by the Cardholder at The Bancorp Bank will be aggregated up to the coverage limit, currently $250,000.00. 8 A cardholder may receive an unlimited number of Refer-a-Friend rewards while program is available. No rewards credited to either party if referred individual had a PayPal Prepaid Card that was used for a value load, purchase, cash withdrawal, or incurred a balance inquiry fee at any time during the 180 calendar days before the day the $10 load requirement is fully met. Only cash loads and direct deposits count towards the minimum load requirement. Allow 2 business days for $5 credit to appear on each Card Account. If a cardholder accrues $600 or more in Refer-a-Friend rewards in a calendar year, Netspend will mail cardholder an IRS Form 1099-MISC reflecting the total Refer-a-Friend rewards for such calendar year. Cardholder acknowledges that by referring a friend through this program, cardholder is releasing non-public information. Referred person acknowledges that payment of the referral may result in the cardholder’s knowledge of referred person establishing a Card Account with us. The Bancorp Bank and PayPal are not affiliated in any way with the Refer-a-Friend rewards program and does not endorse or sponsor this program. The PayPal Prepaid Mastercard is issued by The Bancorp Bank, Member FDIC, pursuant to license by Mastercard International Incorporated. Netspend, a TSYS® Company, is an authorized representative of The Bancorp Bank. Certain products and services may be licensed under U.S. Patent Nos. 6,000,608 and 6,189,787. Use of the Card Account is subject to activation, identity verification and funds availability. Transaction fees, terms, and conditions apply to the use and reloading of the Card Account. See the Cardholder Agreement for details.